Lorne Jackson finds nothing is as it seems in the strange reality of photographic artists The Jackson Twins. Meeting the Jackson Twins for the first time is a bit of a shocker. For a start, neither of them look particularly evil, though I’m sure one of them has to be. Secondly, before they walk into the Rhubarb East Gallery in Digbeth, I am expecting a couple of giraffe-limbed lovelies, caked in make-up and slinky as supermodels. A buff-blonde blend of vixen and vamp. Instead, I’m confronted by two short, fresh-faced, preppy looking twins in casual wear. Oh, and they aren’t females, either. 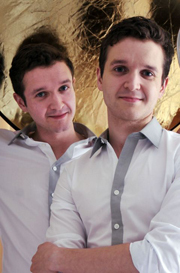 The Jackson Twins are Karl and Ian, two brothers who work in the medium of photography, though you could argue that their real medium is make belief. Karl and Ian are fantasists, fibbers and arch-fabricators. Together they create photographs that are as close to reality as John O’Groats is to Land’s End. The images they produce are dark and creepy. Goosebump Gothic. A devoted young couple wouldn’t want the twins taking their wedding snaps. Though they would be the perfect photographers for commemorating the nuptials of Morticia and Gomez Addams. In many of the Jackson photographs, the twins – who appear in all their pictures, to the exclusion of anyone else – dress as glamorous women. Which explains my surprise on meeting them. Evil is also a motif. In each photograph, one of the brothers assumes the role of the evil twin. Not all of the most striking images have the twins dressed as women. 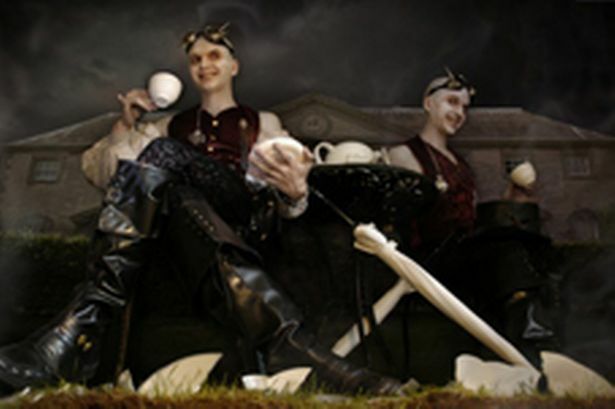 One memorable lightning flash of high drama has them appearing as bald-headed beings (human doesn’t seem to be the word I want to use, here) grinning malevolently, though holding cups of tea like genteel English gents, pinkies politely raised. The Jackson Twins work will appeal to anyone who admires Lady Gaga, The Rocky Horror Picture Show and classic Hammer Horror movies. I’m certainly a fan, though even I’m at a loss to explain what it all means. All of the photos comes with a cryptic title which hints at a deeper meaning; an invisible narrative to go with the pictures. “We wanted to create titles that almost seemed to be quotes from books,” explains Ian. “The titles we came up with were the product of a bottle of wine and a few thesauruses and dictionaries scattered around the floor. “That helped us to create sentences and phrases that look like they could have been lifted straight from books. The Jacksons have strong ideas about the stories behind the images, though they don’t want to impose their opinions on the viewer, and are happy for their audience to come up with stories of their own. “We can identify which is the evil twin and which one is the good twin in each picture,” says Karl. “But if the viewer sees it differently from us, that’s fine. “We really enjoy surrendering our narrative and giving it over to the viewer. Their story might be completely different from ours. They might see the evil and good twins differently. The Jackson Twins are 29 years old, though in their photographs they are everything from eighteen to eighty. When they were school boys they struggled with their mixed identity, yet now they embrace it. But as artists and men, isn’t it problematic subsuming two separate personalities into joint pieces of work? “We’re quite lucky,” says Ian. “Up to a point we do express our individuality, but there’s also this unit, this joint identity, that we can also express. “It was a frustration, growing up. Always being referred to as ‘the twins’. Especially in high school, which is the point when you are trying to work out who you are. I think in hindsight it worked out brilliantly for us, as it allows us to be Ian and Karl, and ‘the twins’. “Um, well, not really,” admits Karl. “We cheated, actually. They’d ask one of us to think of a girl’s name, and then see if the other one knew who it was. Freaking people out with their tortured, twin-based lies is still what makes the brothers tick. Though they claim that within that original schoolboy lie lurked a kernel of truth. The brothers studied fine art at Birmingham City University, where they planned on working on separate projects. But the art they produced was so similar, both in inspiration and execution, that their tutors encouraged them to collaborate, which they began doing in their second year. One of the key evolutions of the Jackson method since student days is that they now rarely use Photoshop, or any other form of computer doctoring of images. As surreal and demented as the pictures look, they are actually put together in the living room of the three storey house the twins share with their partners in Rugby. The brothers put on their own make-up, create their clothes, or source them from the internet, then construct a theatrical backdrop. A camera with a built in timer allows them to snap the final image. When it came to make-up techniques, they were initially influenced by Kevyn Aucoin, the American make-up artist who worked with major celebrities before dying, aged 40 in 2002. “He published these books with make-up tips which became our bibles,” says Ian. “But we also used our painting know-how along with the make-up tips, until we had perfected our own transformation process. We now completely design our own look. We’re no longer following steps from a book. The twins even dressed up for the opening of their exhibition at Rhubarb East. Initially they were both going to arrive as Alice, from Alice In Wonderland (they love the new Tim Burton movie version of Alice – very Jackson Twins). But they couldn’t find the right frocks, so instead came as Tweedledum and Tweedledee. But why do they so often end up as women in their work? “Well, it goes back to school days again,” says Ian. “Being forced to share an identity. “The initial idea of the collaboration was to become other people in the artworks, rather than stick to the same old identity we have been forced to share for twenty nine years. Another reason for dressing in drag – though the lads don’t mention this – must be that they are both in possession of very fine pairs of legs, ideal for swanking around in high heels and tight skirts. Their career also has legs. Though they are still in the process of finding their way in the international art world, great things should be expected of the twins. Double trouble and double delights – those Jacksons fellows are capable of almost anything. * For more information about the Jackson Twins visit their website, www.thejacksontwins.com. Rhubarb-East, where the Jackson Twins work is being exhibited, is a new gallery in Heath Mill Lane, Eastside, Birmingham, dedicated to photography, which opened on March 27. An independent commercial gallery, it has some of the world’s most acclaimed contemporary photographic images for sale – from both regional and international artists. Rhubarb has generated its own investment from commissions and an artists development programme. Based in the ground floor of the newly opened Rhubarb development, the gallery acts as a sales showcase for the successes of the year-round Rhubarb-Rhubarb programme of support for artists, projects and international happenings. The Jackson Twins were chosen, along with Paris-based photographer, Vee Speers, to launch the gallery, with their joint series of work, brought together under the title The Uses of Enchantment. All sets of photographs were inspired by fable and fairy stories. The Uses of Enchantment – The Jackson Twins & Vee Speers, is showing until Saturday June 12, (Tuesdays – Saturdays 11am-5.30pm) at the Rhubarb East Gallery, Rhubarb Building, 25 Heath Mill Lane, Birmingham.